The nature of Spring is to create objects in its container so that when you need an object, you can call Spring container to get that object. Therefore, Spring seeks all the ways to support us in the creation of objects in the container of the most easily. We knew how to inject this object into another object, or we can say: put object dependencies on dependent objects, using the ref, idref, list attribute, … In addition, Spring also helps us to place the object dependencies into the dependent object automatically using its Bean Autowiring. 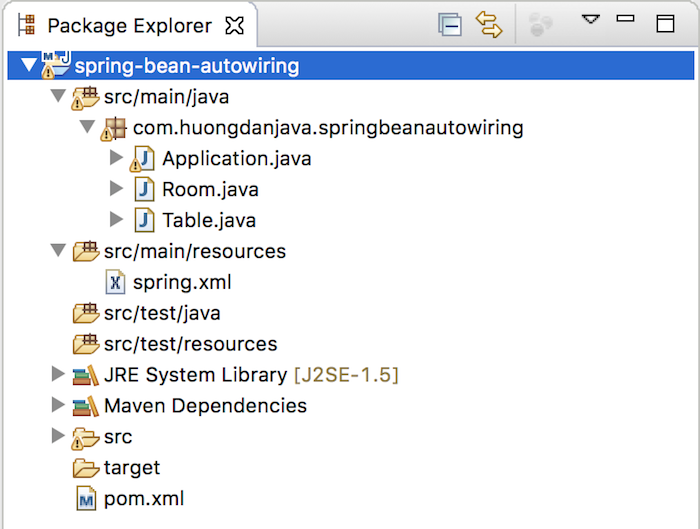 With Bean Autowiring, we do not need to use the ref, idref, or list attributes anymore, … just write code that complies with Spring’s rules, objects dependencies will be automatically injected into the dependent object. OK, now I will go one by one and tell you more about it! As you all know, every bean in a Spring container has its own id. 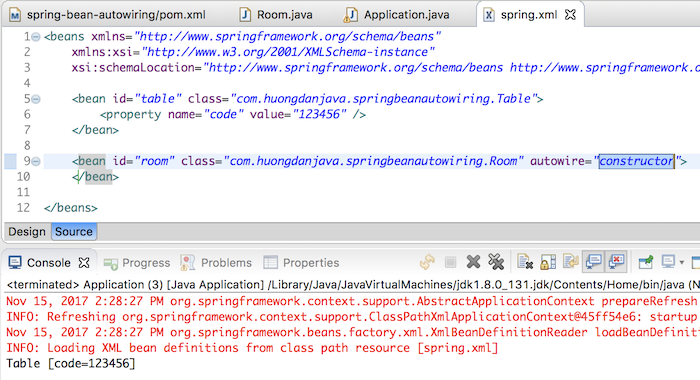 Based on this, Spring specifies if the id of the object dependency (in this example is a Table object) is the same as the name of a variable in the dependent object (Room object) and when declaring the dependent object, we declare the attribute autowire=”byName”, so Spring will automatically put the object dependency into the dependent object via the setter method of the dependent object. In our example, the id of the Table object is exactly the same as the table variable name in the Room object, so we just need to declare more for the bean room a property autowire=”byName”. 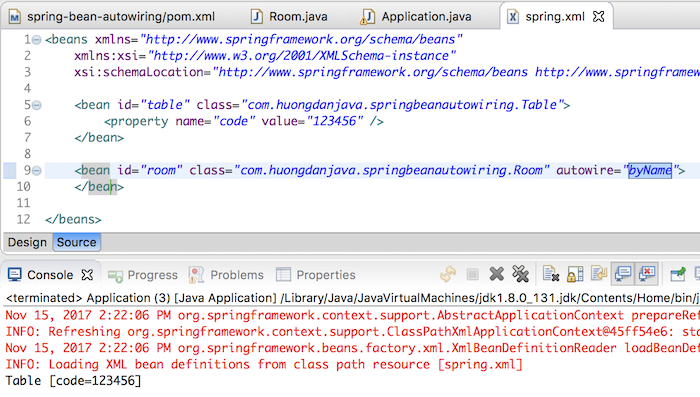 Then, Spring will inject Table object into the Room object for us. 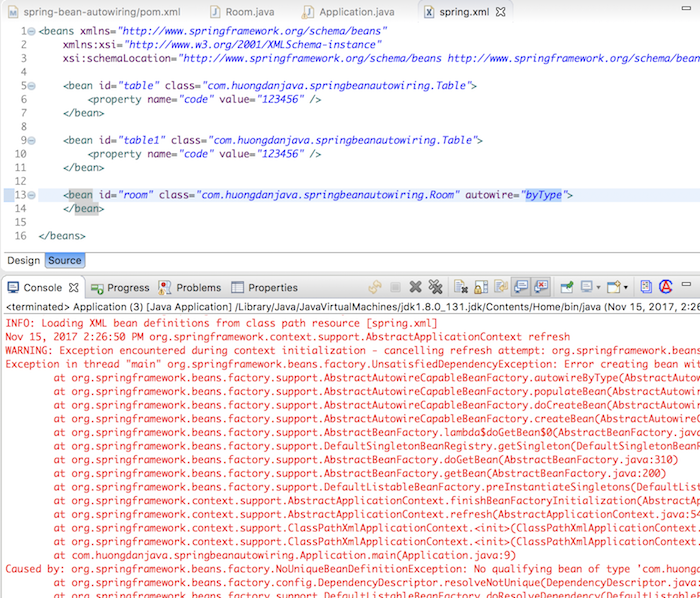 This has the disadvantage that if we later change the variable name of the dependent object, we must modify the id of the object dependency in Spring’s container and vice versa. Can you imagine it? This approach is applicable only to small projects where each object has only one bean in the Spring container. By changing the autowire=”byType” attribute when declaring a bean, Spring automatically puts the object dependency into the dependent object via the setter of the dependent object. 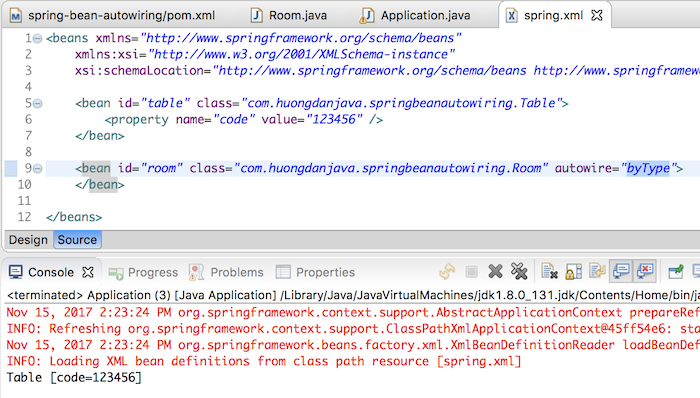 Like the attribute autowire=”byType”, this method only applies when our object has only one bean in Spring’s container. Then, Spring will automatically put the object dependency into the dependent object through the constructor of the dependent object.